Peak expiratory flow rate (PEFR) and Peak inspiratory flow (PIF) were measured using a newly designed Pink city flow meter and compared with standard Wright peak flow meter. The values of PEFR showed highly significant correlation on linear regression analysis (r =0.86, P<0.001). When peak expiratory and inspiratory flow rates determined by five different Pink city flow meters were compared to evaluate inter-product variation, results again showed a highly significant correlation on linear regression analysis. The authors recommend routine use of Pink city flow meter for patients with obstructive airway disease in view of its easy availability, low cost and accuracy. 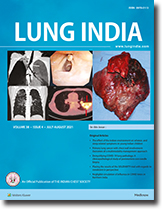 Over a period of 18 months 240 bronchoscopies were performed mainly for diagnostic evaluation. The procedure, the outcome and complications are discussed. Fibrescopy is safe in experienced hands. Serum protein bound fucose and ESR levels were estimated in 20 healthy control subjects, and 70 patients with pulmonary tuberculosis. The mean serum fucose value in controls was 10.13 Â± 1.97 mg%. The fucose levels were significantly higher in patients with cavitary disease and those with positive sputum. Serial comparison of mean serum fucose and ESR levels, before and during treatment, showed a trend towards fall in both; the fall in fucose being more steady and more complete at three months. A patient with discharging chest wall sinus, proved to be actinomycotic is described. He responded well to crystalline penicillin. In patients with discharging sinuses, anaerobic culture can help in establishing the dignosis of actinomycosis. A case of Pulmonary Alveolar Microlithiasis in a young girl with classical radiological features is reported. Aetiopathogenesis is discussed in brief. Eighty consecutive patients with pneumothorax were studied. 12.5% did not have definable aetiology (considered to be the idiopathic variety). Tuberculous aetiology was established in 57.5% of patients. Minor pneumothorax responds well to bed rest and therapy of the primary disease. Needle aspiration is unsatisfactory. Intercostal tube drainage appears to be the best method.